Hey Naturals how y’all feeling! Cocoa butter kisses all around! I just want to talk to you all about dusting. Dusting is a technique of trimming that allows you to hold on to a bit of length (Girl that’s a win!). The goal is for when you finish you end up with what looks as if you have been dusting ( Hints the name). Now that we know what dusting is we can get into it! let me tell y’all how a few weeks ago I did some dusting. I went through my normal routine of a wash-day. But, see the way those single strands knots was sett up…… I had no choice but to address the problem head on you feel me. A.K.A the curls was knotting up baby gurl! The snip snip was necessary! Once my hair dried I took each individual curl( not strand) and I went to the very end of my hair and I clipped off the very end. When I say the very end I mean the very end! You know at the end of your curl where it curls under that is where I snipped (Similar to the curly girl method of trimming). After I finished dusting I was freed up from the split ends that I was suffering from. Not only did I free myself from the split ends I was able to hold on to length in the process. Here is the thing with dusting, dusting is maintenance or a band aid ( temporary fix) until you can really get at those ends ( a full trim an inch or as needed). Dusting or clipping can be great! It is an awesome way to maintain a trim. If you are looking for a technique that stops you from getting too scissor happy. It’s a perfect way to just got the job done quick, fast, and in a hurry! Let me know in the comments how you get the job done when it comes to maintaining your healthy ends. Remember, be happy, be curly, be you, and you will never fail! 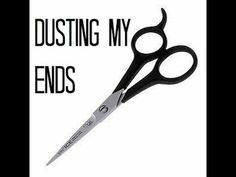 This Post was posted in Hair care, natural hair and tagged #clippingends, #dusting, #healthyends, #natural, #naturalhair, #naturalhaircommunity, #naturalhairdaily, #naturalhairrocks, #naturalhairstyles, #teamnatural, #trimming. Bookmark the permalink.